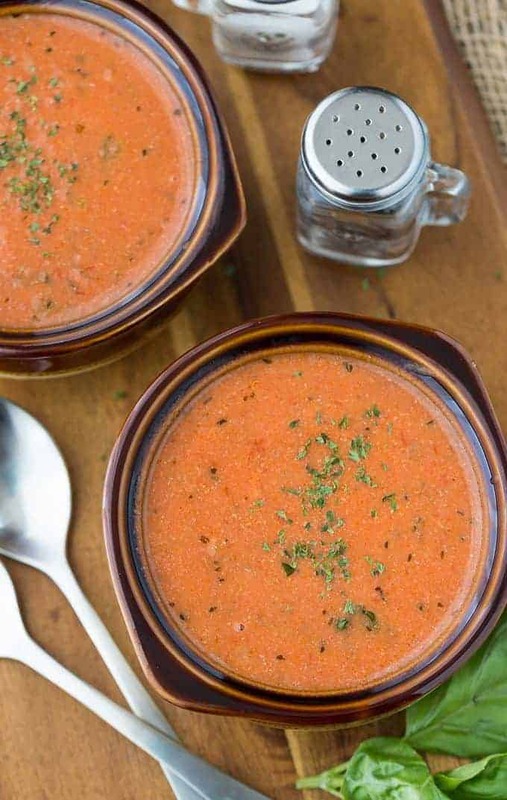 This Cream of Tomato Soup is hot and tasty and made with a few simple ingredients! As the winter drags on and the temperature dips in Vermont, I find myself craving something nice and warm for lunch instead of a salad. I don’t want to totally blow my daily calorie allowance by choosing something high in fat and calories though. I’d like to enjoy a hot lunch that is healthy at the same time. This Cream of Tomato Soup fits the bill perfectly. One of my favorite cold weather lunches is a big bowl of cream of tomato soup. You don’t need to head to the grocery store to buy a can of soup to enjoy this. 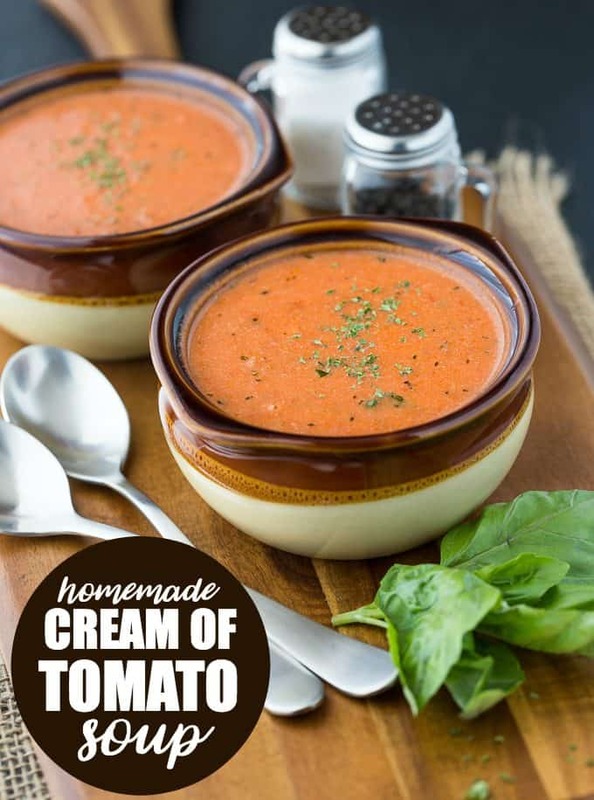 It’s very simple to make your own homemade cream of tomato soup with only a few basic ingredients. I used low fat milk in this recipe, but you could just as easily use 2% milk. Use whatever kind of milk you have in your fridge. Let’s keep it simple! Making Cream of Tomato Soup is easy! The first thing you need to do is sauté the onion and garlic in olive oil until it’s softened. Add the tomatoes, baking soda (I’ll explain why in a minute), parsley, salt and pepper. Bring the mixture to a boil. 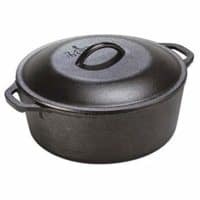 Turn down the heat to medium low and simmer for 10 minutes. Add the honey and basil. Taste test to see if the soup needs more salt or pepper. Add in skim milk. 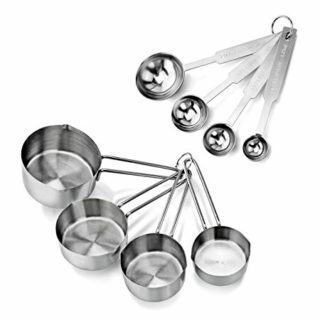 Use either two to three cups depending on whether you like your soup thicker or thinner. Continue to heat until it’s nice and warm. I love serving this Cream of Tomato Soup with a grilled cheese sandwich for lunch. I will dunk my sandwich into my soup. It also pairs nicely with a side tossed salad. It’s filling enough on its own, however, if you don’t feel like making anything extra to go along with it. Why Put Baking Soda in Tomato Soup? You may be wondering why add baking soda? It’s so the acidity of the tomatoes doesn’t curdle the milk. No one wants weird unknown chunks floating around in their soup! Soup’s on! I’ve got several soup varieties to satisfy your cravings. Sausage & Cabbage Soup: This low carb soup is easy to make and tastes delish! It’s comfort food perfect for a cold winter’s day. Hamburger Soup: My version of my grandma’s favourite soup. It’s hearty, filling and flavourful. Enjoy a piping hot bowl on a cold winter’s day. Cauliflower Soup with Bacon: Creamy, luscious comfort food to keep you warm! Cabbage Roll Soup: Everything I love about a cabbage roll, but 100 times easier to make! You might also like this Tomato Florentine Soup. Hot and tasty and made with a few simple ingredients! Saute the onion and garlic in the olive oil until it is translucent. Add the tomatoes, baking soda, parsley and salt and pepper. Bring to a boil. Simmer for 10 minutes over medium low heat. Add the honey and basil. Check and add more salt and pepper as needed. 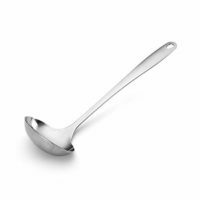 Add in 2 to 3 cups of skim or low fat milk depending on whether you prefer your cream of tomato soup thicker or thinner. Warm & serve. Ellen is a busy mom of two teenagers who left the corporate world in 2008 to focus on a more eco-friendly life. She lives in rural Vermont where she juggles family, two blogs and a career in social media. You can find her at Confessions of an Overworked Mom and The Socialite’s Closet. Sounds yummy! Thanks for the recipe! Looks so good and sounds delicious too. I will make some this way instead of opening a can the next time I make tomato soup. Only thing is the baking soda in it – I never heard of that before. I wonder why that is used in it? thanks for the recipe tho. Hi Ann – The baking soda helps cut some of the acid of the tomatoes. Just stir it in. You won’t taste it at all. Absolutely love tomato soup, had to pin this one and save it for later! Thank our for the recipe and the tip on the acid in tomatoes. Now that it’s winter, it’s the perfect time to try some new soup recipes. Thanks! This looks delicious. I love tomato soup with grilled cheese sandwiches in the winter! 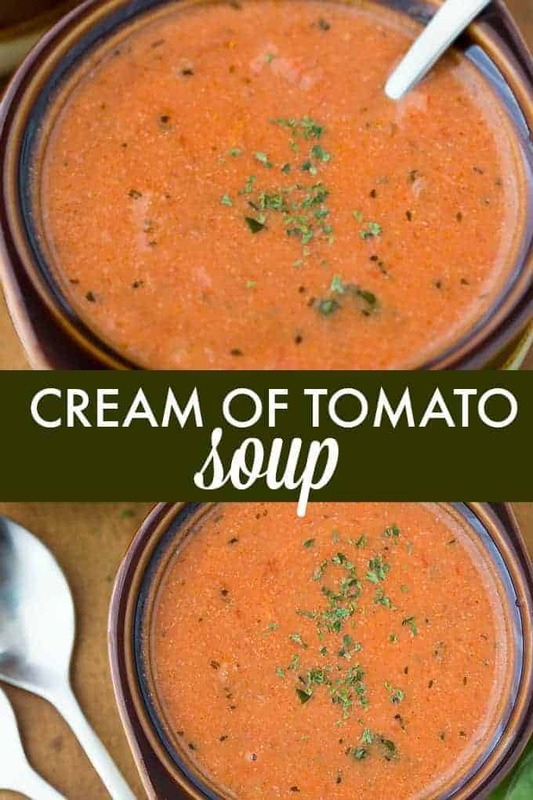 I love cream of tomato soup, I will definitely be making this. Oh I love tomato soup! Perfect recipe for those cold nights you don’t feel like a heavy meal, but a comforting one! Thanks for posting!!! I will be trying this. I also love the classic cream of tomato soup and grilled cheese sandwich combo mentioned upthread. I’ll eat it anytime, though. YUM! I made this, and added some hot red pepper flakes and replaced the milk with non-fat Greek yoghurt (heated very gently after adding) – delicious. Thanks for the recipe! Great recipe – love garlic in tomato soup. I add croutons and black pepper. Really like it. I’m not a big tomato fan, but my husband and mother love them. They sure would enjoy this! I’m making this today! It sounds easy and delicious. Thank you! This looks delicious. I have actually never tried tomato soup! I LOVE tomato soup but hate buying those cans of artificial stuff. Thanks for the recipe! I love tomato soup but I’ve never tried homemade. Looks delicious! one of my fsvorite comfort foods, thanks! I absolutely love tomato soup, especially in winter, but have never tried to make my own. I’m going to save this recipe! Thank you for sharing! Thank you so much for sharing! Tomato soup is the best! Looks delicious! I love Ellen. This looks like another great recipe from her. Fabulous! I am a soup freak year-round so this is perfect. THanks for sharing. sounds delicious thank you for the recipe ! I love tomato soup. This recipe looks delicious and easy to prepare. Thanks for sharing. 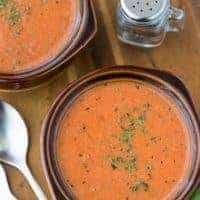 I love tomato soup and I can’t wait to try this recipe thank you so much! I love tomato soup but the canned stuff always tastes too salty for me. This sounds easy and delicious! This recipe looks so yummy, I’ll be making this tonight for dinner! I need a bowl of this! Thank you so much for this recipe. It looks and sounds sooooo good!! Love to try this! Thanks for sharing! This looks delicious! I make homemade soups all the time and I love tomato soup, but that’s one soup I’ve never made! But I will be making it soon after seeing/reading this recipe! Thanks! This looks good. I must try! Looks amazing. So going to try this! OMG, this looks good – I’m going to try it tomorrow! I never would have thought to put honey in it!! Live and learn, right? I had to check out your recipe. Years ago, a friend gave me her tomato soup recipe and I lost it. I think it was very similar to your recipe! Thx. This looks great…will have to give it a try. I absolutely love Trader Joes Organic Tomato and Red Pepper soup….haven’t made my own all winter! Thanks for the recipe . It sounds good. this sounds like a wonderful recipe! I’m going to try it. Think I’ve figured out a new recipe to try 😀 Thanks so much!